Hagbard is very happy tonight. We are having stuffed bread which has been one of his favorites since we married 16 years ago. The man loves stuffed food. 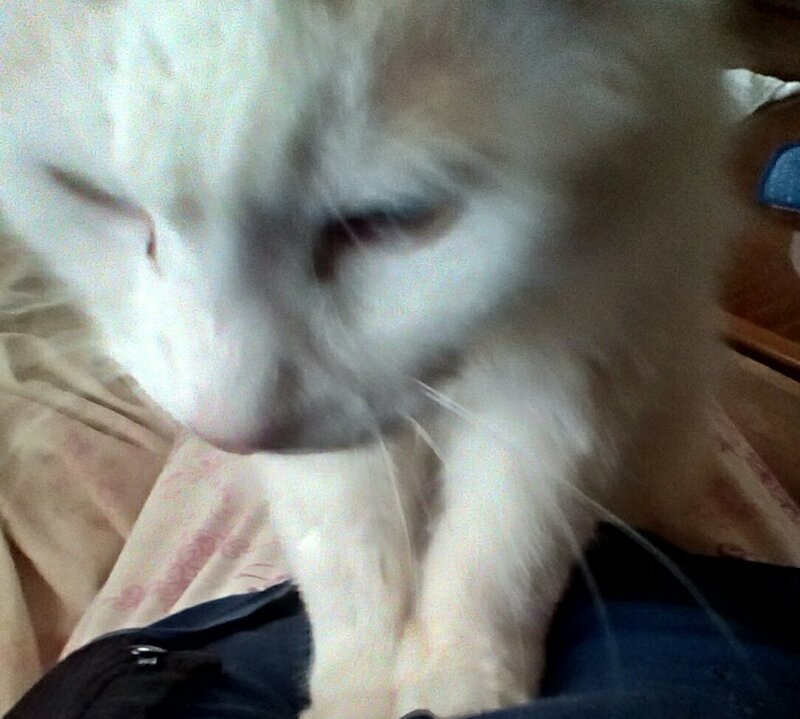 He also loves clothes with tons of pockets. I think they are related somehow. He’s a complicated person. Back to the stuffed bread making! I made slow cooker shredded buffalo chicken to use tonight. http://hostthetoast.com/5-bc-recipes/ I also made some basic white bread dough today. You can use canned bread dough. I usually make my own because it is cheaper and I like kneading dough. It feels kind of therapeutic. I vary the filling and type of bread dough I use for stuffed bread so if one day you want to use crescent roll, French bread or pizza dough with other meats, cheeses or vegetables you can. Just follow these basic steps for whatever variation you choose. This is the first time I’ve used buffalo chicken as the filling. I like to bake my stuffed bread on a preheated pizza stone. I inherited my pizza stone completely unused from my parents. They had it for years gathering dust in the original packaging- wisely they passed it on to me. I’ve used it like crazy ever since for making pizza, naan, pita bread, and stuffed bread. If you don’t have one just use a baking sheet. Preheat oven to 350°F. Heat the pizza stone for at least 10 minutes if you are using it. Grease your baking sheet if you are using that instead. On a lightly floured surface, roll the dough out in a rectangle about 1/4″ thick. Put chicken and cheese in center leaving stopping about 1″ from the ends and about 2″ from the sides. Cut in from the edges to the center in 1″ intervals on both sides. Fold ends in and overlap alternate side pieces over the filling. Optional: Before baking, butter or spray the top with cooking spray. Sprinkle with Parmesan cheese and dill weed. Place loaf on baking sheet or pizza stone. Bake 20-30 minutes. Let stand about 10 minutes before slicing. Makes 4-6 servings. Tuck in the ends first. Look at that warm melty cheese oozing out! Yum! Hagbard- This is really tasty. I want the leftovers for lunch tomorrow… if we have any leftovers! Lounmoun- This IS tasty but oozy. I have to alternate which end I eat from so I don’t squish all the filling out! I think maybe some red pepper flakes would be good in or on this. Some onion or blue cheese might be nice in it too. Amethesto- Did not eat dinner here with us tonight. Did not inherit her father’s love of stuffed food anyway. More for us! In our house something strange happens to bananas. We buy them and people eat them… except they stop when there are 2 or 3 left every time. 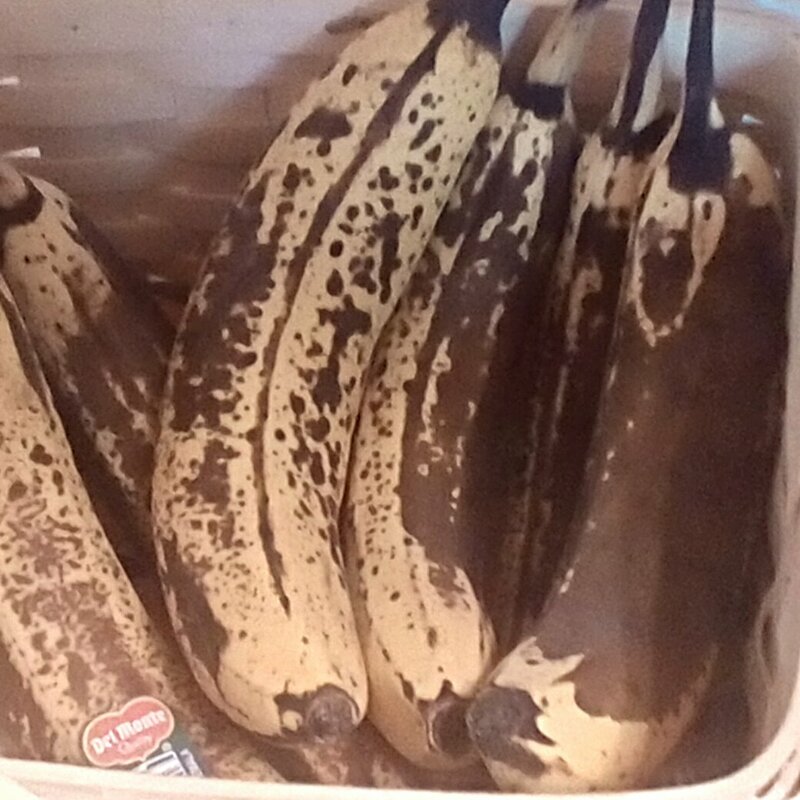 The bananas just sit there getting browner and sadder waiting for something to happen to them. Monsters! Those poor bananas. I have to save them from the trash by putting them in banana bread. It took me awhile to notice that the banana consumption pattern was no accident. Hagbard loves banana bread. Brown bananas make the best banana bread. This is a plot to get banana bread! 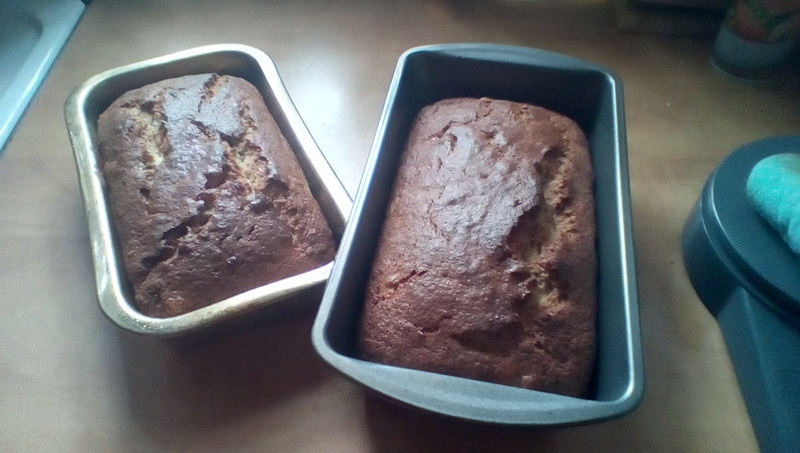 This week 6 bananas were left to get brown so I set out to make 2 loaves. Clever fiend! My trusty basic banana bread recipe is from the Better Homes and Gardens New Cookbook published in 1996. That is the year I graduated college and this was the second cookbook I ever owned. I have tried other banana bread recipes but this is Hagbard’s favorite. This is quick and easy to mix up but takes 40-50 minutes to bake. Your house will smell great about 20 minutes in! I used half all purpose flour and half whole wheat flour. I put in 1/2 tsp lemon juice instead of the optional lemon peel. Hagbard hates nuts in banana bread so no nuts in my loaves. 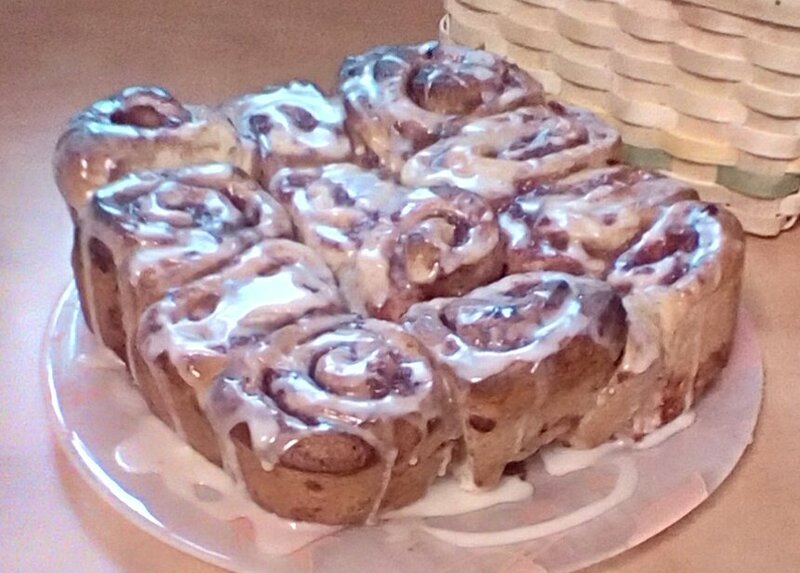 In a medium bowl combine flour, salt, baking powder, baking soda, and cinnamon. Set aside. In another bowl combine egg, mashed banana, sugar, cooking oil, and lemon peel/juice. Add banana mixture to flour mixture and stir until just moistened. Fold in nuts. Spoon batter into prepared loaf pan. Bake 40-50 minutes or until a wooden toothpick inserted near center comes out clean. Cool in pans for 10 minutes. Remove from pans and cool on wire rack completely. Wrap and store overnight before slicing. Makes 1 loaf. As you can see your banana bread will crack on top and be a medium brown when done. You will want to eat it right away. Don’t do it man! Seriously, let the banana bread cool down and sit several hours or overnight before cutting it. It is hard to wait but it is even better if you do that. When I make two loaves like this I usually put one in the freezer after it cools. When we want it I just thaw it at room temperature and it is good to go. This time Hagbard is taking a loaf to share at work. He’ll probably share it. We enjoy eating our slice of banana bread plain, with butter, with honey or even spread with some peanut butter. I saw an idea once for a banana bread sandwich with peanut butter and bacon but that is going too bonkers for me. If you are a bacon lover you might try it though.